From its haunting acoustic guitar intro, to the signature vocals of Myles Kennedy the first song, Cry from Achilles sets you up to what is the best album the band has made to date. When the band kicks into full gear, you can hear a heavier Alter Bridge. Like their previous disc AB III, this disc continues a trend where the music is darker than either their debut or Blackbird. 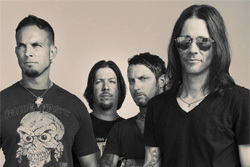 Alter Bridge: sunglasses for all. Mark Tremonti�s signature palm-muted guitar riffs can be heard throughout the verses of the first single, Addicted to Pain (see video below). While the chorus, shows the melodic and dynamic vocal range of Kennedy. The song also features one of Tremonti�s highlights, a ripping guitar solo that leads back into the chorus. Bleed It Out continues the heaviness through its intro, while the verses feature a stop and go feel, with Kennedy�s soaring vocals over everything. As far as dynamics are considered, this is one of the best examples of what Alter Bridge does best. Lover starts with an acoustic guitar, and Kennedy singing softly. There is a nice short bluesy lead, forty-five seconds in. Kennedy�s vocals are emotional, powerful, and they draw you in to the song. His vocals are some of the best in rock music in my opinion he finds a way to express everything he is singing, whether the emotion is sad, happy, or angry. The Uninvited and Peace Is Broken are two songs that carry the middle of the disc, with everything that you have come to know from the band. Peace Is Broken has one of my favorite riffs from Tremonti, a razor sharp in your face melody that is as technical as it is melodic. Calm The Fire, features an intro with Kennedy singing in a very high yet haunting falsetto. If you listen carefully you can hear Tremonti, playing a sweeping arpeggio behind the layers of rhythm guitar. I can honestly say this is my favorite song on the disc, and one of my favorite Alter Bridge songs. A minute and 50 seconds in, the song morphs into a straight ahead rocker. It�s definitely a song I can listen to over and over again. Water�s Rising if I am right, is Tremonti taking the lead on vocals during the verses of the song. He has a very deep and powerful voice himself. If you haven�t heard his solo disc, All I Was, then his vocals might come as a surprise. Tremonti and Kennedy�s vocals blend perfectly in harmony during the chorus, I hope they do more songs like this in the future. Farther Then the Sun and Cry A River, are two very solid rockers, while the ballad All Ends Well, is a powerful vocals, that again allow Kennedy�s vocals to shine. His vocals here remind me of the song Broken Wings off their debut disc, especially in the chorus, its something I can�t begin to describe, how good it is. The title track is last and it is also the longest song coming in at almost seven minutes and forty seconds. You could call this the epitome of everything Alter Bridge does wrapped into one song. From the clean guitar intro and Kennedy�s soaring vocals to the chorus that draws you in. This song features a few different melodies and styles, and closes out an amazing disc, leaving us waiting for their next album. 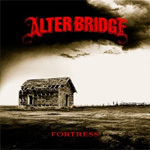 Alter Bridge has definitely taken what they did before, and expanded on that formula to create their best album yet. Fortress hits your local cd store and digital media outlets on October 8th Easily recommended to fans of Modern American Hard Rock! 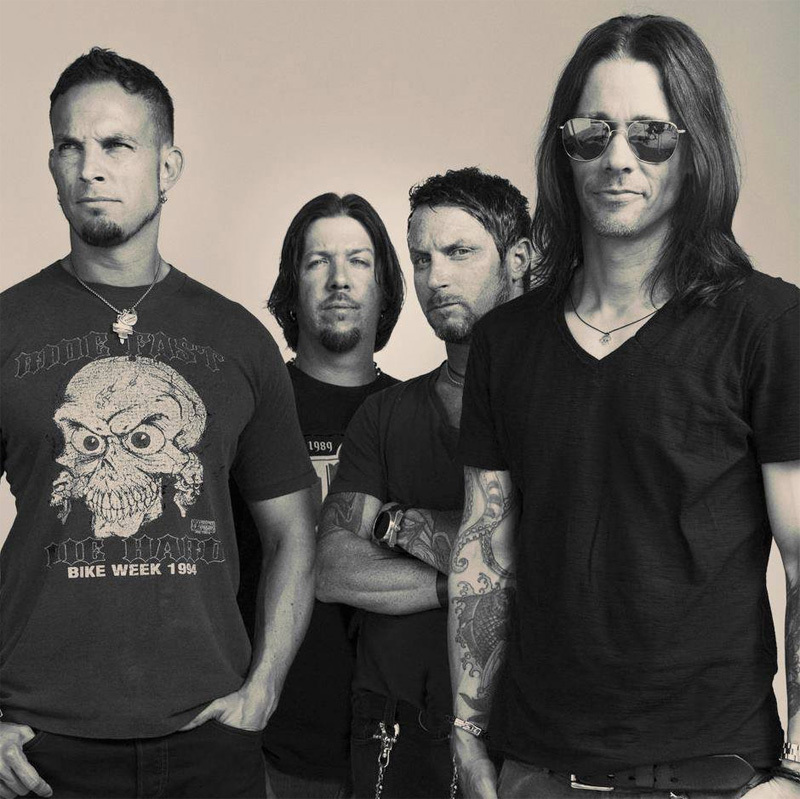 Alter Bridge has taken what they did before and expanded on that formula to create their best album yet.